In this Development Diary entry, I will illustrate how Cold War-era tactics, equipment and thinking can reflect in the game. While the game covers any period from 1965 to 1991, and a wide array of situations can be chosen, in this case we will concentrate on a single aspect: night-time operations and importance of thermal sights on tactical battlefield. This was especially the case when forward-looking-infrared (FLIR) weapon sights (aka thermal) were introduced in the late 1970s. This technology provided soldiers a different way of observing the battlefield at night as well as during the day. The theatre of combat became round-the-clock activity, enabling personnel to carry out operations that otherwise would not be possible, even in the most difficult of conditions. There are two main classes of night-vision devices: image intensification and thermal. Intensification relies on the existing light to enhance an image. Thermal, by contrast, uses heat emissions to identify objects. Sights such as those on the M1 Abrams or M60A3 (TTS) tank, the Bradley, or Apache helicopter are of the latter type. On the other hand, the Soviet Union invested heavily into former, producing top-notched image intensification systems, but the performance of thermal technology by far outstripped even the best Soviet light amplification system at that time. In hindsight, it is quite clear that pursuing light intensification technology instead of investing in prospective thermal imaging sights was a huge mistake, one that ended up setting back the Soviet Union by nearly a decade in this field. 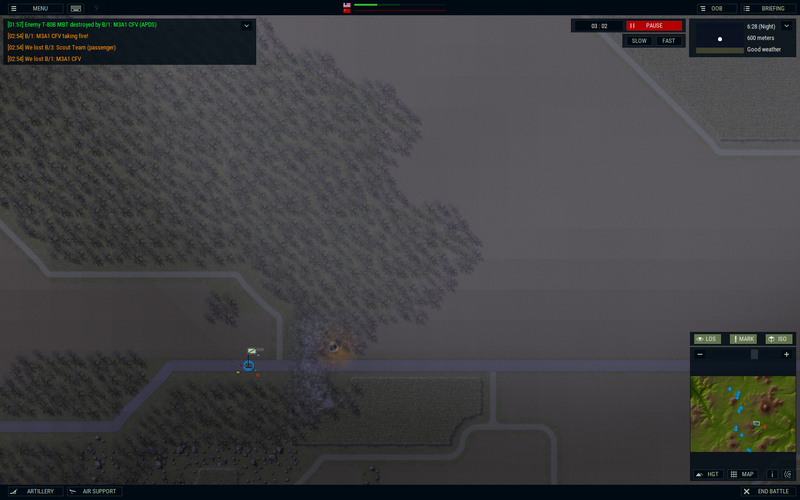 To exemplify that disparity in performance, we will set our scenario in 1989, pitting elements of a US Armor Cavalry Squadron against a Soviet tank regimental force advancing in early morning hours, still very dark. Our force consists of an A (Apache) Cavalry Troop and D (Dakota) Tank Company, for a total of 18x M1A1 Abrams, 12x M3A1 CFV and 2x M106A2 107mm self-propelled mortar. They are also supported by an off-map howitzer battery consisting of 8x M109A3 155mm guns and a flight of Apache helicopters. The action takes place across the western half of the valley running south from Schenklengsfeld down to Eiterfeld and Großentaft, on a northern approach to Fulda. The plan is to rely on mobility, protection and firepower to allow both stealthy and forceful maneuver, fully utilizing technological advantage of the thermal sights to destroy the enemy before he can even see us. First step is to deploy our forces and plan target reference points (TRP). Latter are special locations on the battlefield which have been "pre-registered" for an artillery strike (the green crosshairs). We also have a pair of AH-64A Apache helicopter armed with potent fire-and-forget Hellfire missiles. 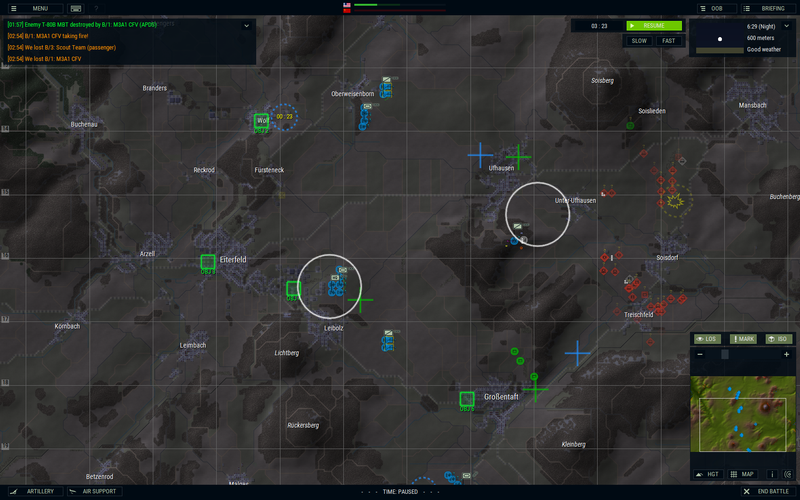 They too require having their battle positions (BP, the blue circles) and TRPs (the blue crosshairs) designated in the setup phase. It is important to note that helicopters operate in a fundamentally different way than fixed-wing close air support. Since the advent of anti-tank helicopters in the early to mid-1970s (as opposed to the gunship helicopters of Vietnam era, or similar Soviet Afghanistan COIN experience) the tactics have been the same. Helicopter commander receives orders to plan for deployment on order to the designated battle position. This is a zone with a line of sight to the desired engagement area and some sort of protective terrain to hide behind. 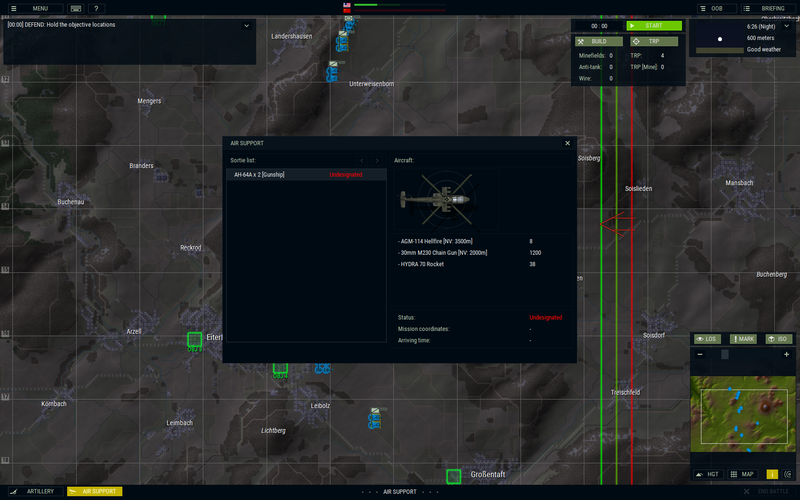 These battle positions are usually designated at brigade or higher HQs in coordination with supported units (for example, attack helicopter formations in the US Army are never OPCON to an echelon below brigade). 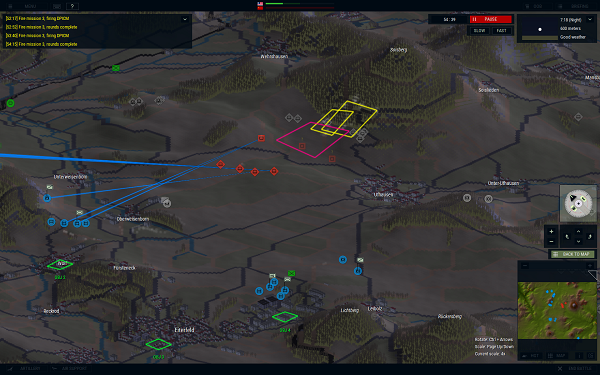 In nearly all cases, they are allocated before the battle during the mission planning process. The point is that helicopters do not cruise across the terrain looking for targets and making moving firing passes the way an aircraft would. Helicopters are too valuable and fragile asset to allow ground commanders to make precipitous and possibly ill-advised on-the-spot redeployment decisions. That aspect might come as a surprise to an average wargamer, but it is based on real-life tactics. On above screenshots you can clearly see the difference between a unit with a night sight, in this case thermals allowing to spot and engage the target as far as 3,500 meters, and infantry unit relying on Eyeball Mk.1 reaching only some 600 meters at best. 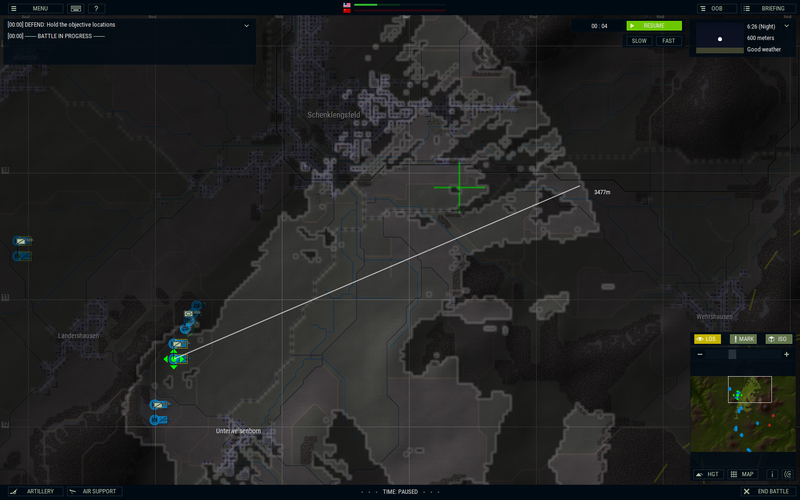 Our strategy will clearly rely on increased precision in locating targets at greater standoff ranges to reduce own casualties while maximizing enemy losses. However, commanders fight the enemy, not the plan. No plan survives intact once contact is made. The enemy rarely acts exactly as predicted. In this case, already in the first minutes of the battle our opponent has used another night-operation technique which predates night vision devices by a long shot: the battlefield illumination. Artificial lighting of the battlefield is the simplest way to penetrate the darkness. In this case an illumination shell (the white circle) was used, which is an artillery projectile used to give night-time illumination over a target area. Illumination and obscuration missions are important functions for artillery or mortar sections, but it should be kept in mind that factors like atmospheric stability, wind velocity, and wind direction can affect their performance, as for example wind can drift the flare. In this case the AI correctly estimated our positions by using reconnaissance in case of our armored reserve east of Eiterfeld, or muzzle flashes and tracers in case of our forward M3A1 sections which encountered the bulk of enemy forces. Latter unfortunately perished, while formed still had to relocate to a reserve position as it was compromised and could have been engaged by artillery. This teaches us that even a technologically inferior opponent should not be underestimated, and that constant maneuver is imperative even in conditions of total darkness. Possessing a superior night time vision in form of thermals can encourage the commander to seize the initiative and perform actions that otherwise would be extremely risky in daytime. 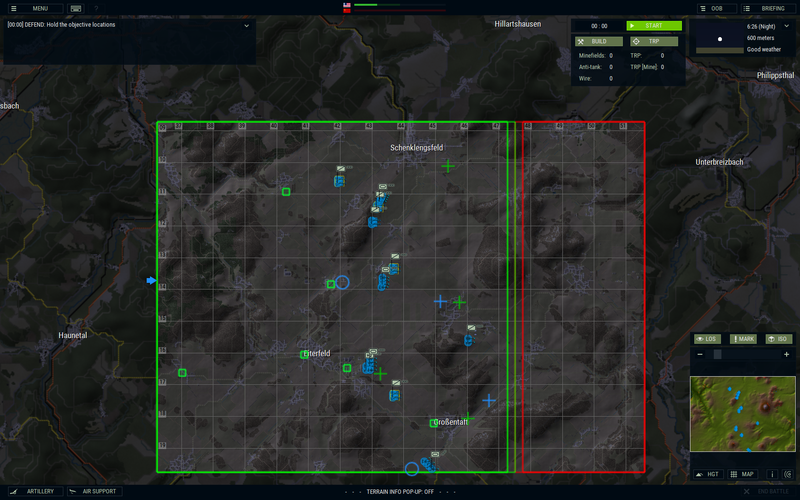 In this case, a platoon of M1A1 Abrams tanks used a secondary route in relative safety of the night to flank the enemy, take them fully by surprise and engage their rear forces with deadly efficiency. Nevertheless, a single tank was lost when it was ambushed by a lone BMP-2 hidden behind the building, reminding us that caution should always be exercised. The outcome of engagements, battles, and major operations depends on not only superior information, but also on superior decision-making based on that information. It should be noted that a successful delaying action or fighting withdrawal, in which the retreating force remains in good order while in contact with the enemy, seeking to inflict as much damage and delay on the superior attacking forces as possible, is considered among the most difficult of military feats, if not the most. In this battle, under the cover of darkness and with greater standoff ranges offered by thermal sights, the delaying force had time to break contact and to find and prepare favorable positions for renewed resistance, as the situation dictated. As the sun rose, the red dawn grew above the burning wrecks of Soviet tanks and vehicles spread across fields of barley and buckwheat. Smoke and dust swirled all over the battlefield. The earth shook from the powerful blasts. Despite five-to-one numerical disadvantage, US Armor Cavalry stood fast and has decimated its opponent for little loss. Of course, this scenario has been simplified serving as an illustration. 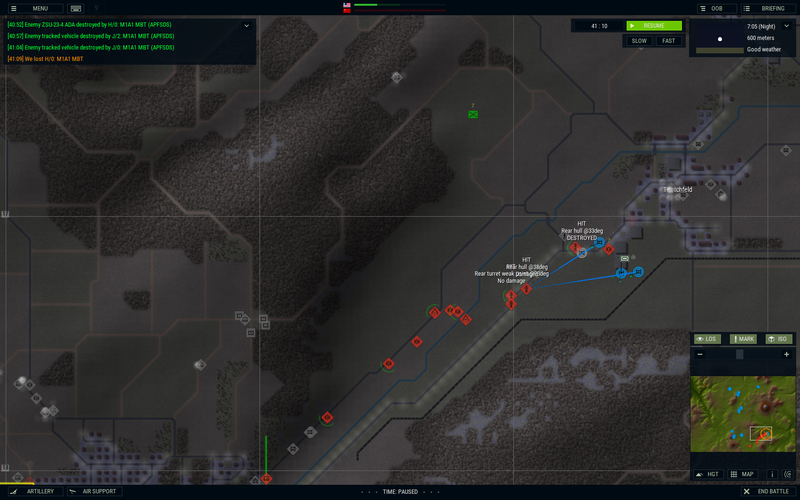 The anticipation of an effectively blind unit moving across hostile open terrain, encountering obstacles, taking enemy fire from unidentified locations, and finally assaulting an enemy that is dug-in and capable of shooting anything that moves is enough to faze even the strongest commander. 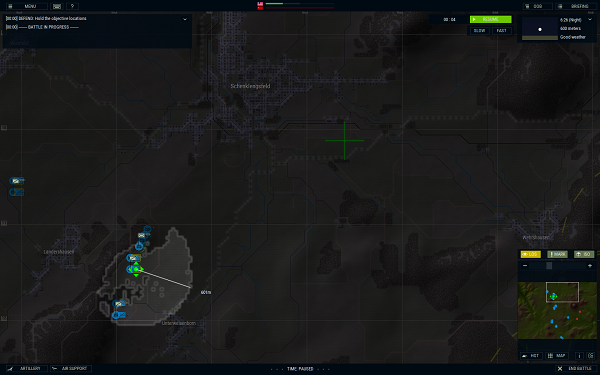 Nevertheless, I hope this short overview of night-operations have shed some light on one of large variety of tactical scenarios this game can offer. Status: offline In the twitch stream from this scenario did the player have the ability to place the ambrams platoon on the enemys extreme rear flank? Will we the players have this ability in this scenario? 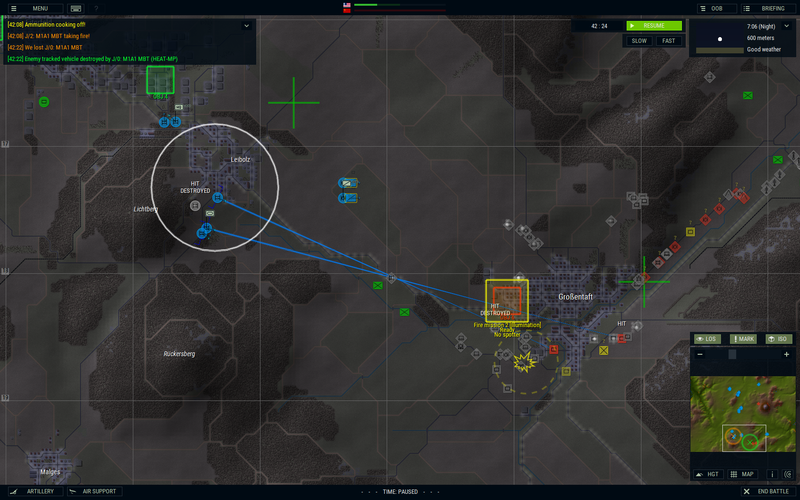 Is the deployment zone that wide? Status: offline I have to admit I am not sure what you mean with extreme rear flank? The position is the south? 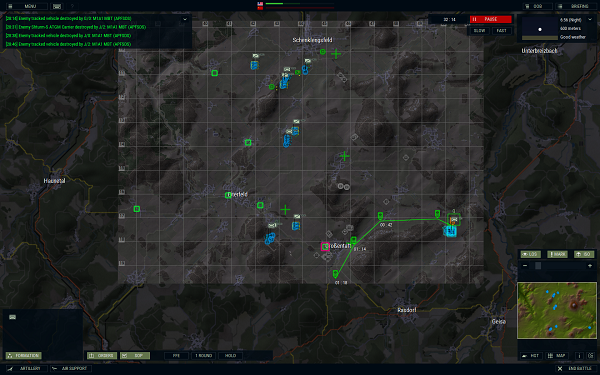 Status: offline The M1 platoon attacking in the south yes. Was this only intendended to show what can be done or is the deployment zone actually that wide in this scenario? Status: offline Òr did they in fact actually manouver that far to get into the enemys rear? Status: offline They maneuvered in this case, but there is an infiltration command that might allow your scouts to end up behind enemy lines. Success depends on training, infiltration deepness, presence of enemy troops etc.